^ Haylen, Paul. Spinal injuries in rugby union, 1970–2003: lessons and responsibilities. The Medical Journal of Australia. 2004, 181 (1): 48–50. PMID 15233614. ^ Llewellyn, David. Hampson remains 'critical' after surgery. The Independent. 18 March 2005 [2009-07-20]. 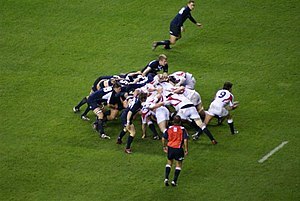 ^ England seeks scrum rule change. bbc.co.uk. 2006-08-21 [2007-10-15]. ^ SIX NATIONS 2016 STATISTICAL REPORT (PDF). World Rugby.